Weather looking good Friday fine 24, Saturday fine and 27. Hopefully a good show. Last edited by mmk on Wed Oct 15, 2008 10:57 pm, edited 1 time in total. flashdance is doing local shows? When was/is ground being handed out? Vee wrote: When was/is ground being handed out? sorry clay meant to say orbitor. - dunno why it aint going to esperance??? mmk wrote: sorry clay meant to say orbitor. - dunno why it aint going to esperance??? ah k, would be good to have a family ride there i guess... does sonny go out there as well with his joints??? mmk wrote: ah k, would be good to have a family ride there i guess... does sonny go out there as well with his joints??? Yeah sonny usually takes his few joints down and the hannos usually go aswell. Sounds like a good little show. Good to see we're hearing about the WA shows. Any photos? ah k. well all the hannos gear is at kelmscott so i guess they are giving it a miss this year. hmmm dunno they usually do both. just have to wait and see who turns up for show day i suppose. where did the sky walker end up this week? It might be at Lismore show with the rest of there gear. I'm not sure if it's came back east yet or not. Geez, they'd have to get back over pretty quick as it was at Waroona show last weekend. Well... due to a certain someone not answering there phone I have litterally no idea where Sky Walker is. It is either still somewhere in WA, Lismore or on it's way back to Queensland. Or for all we know it could pop up at Mildura. Who knows really. Hurricane, it would be kool as if it turned up @ Mildura! Lol yes, I want to know if i'm riding Sky Walker next weekend or not!!! Well... depending on if this full time job at VideoPro comes through (Yes... I left McDonalds ) will really determine my carnivals for the year! Lol, you left the Big M.
Just thought I would mention the Sky Walker is still in Western Australia. 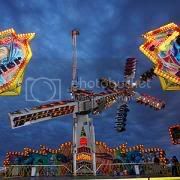 It did Katanning, then Busselton show this weekend and is travelling to Albany for next weekends show.